One of country's most exciting artists comes to one of the country's most beautiful venues for an utterly unique and unforgettable two-night-stand! 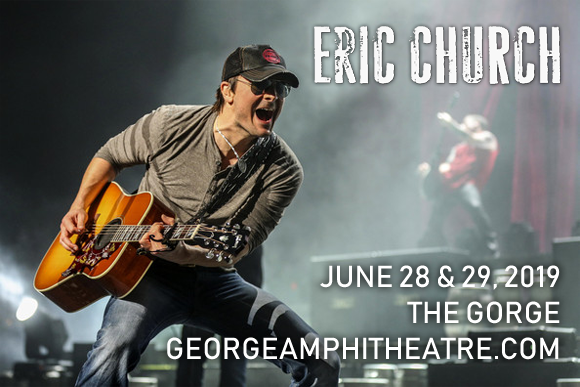 Featuring two hand-crafted set lists and no opening act, Eric Church brings his Double Down Tour to Gorge Amphitheatre for the second night on Saturday 29th June 2019! Church, who is celebrating the release of his sixth studio album, will be treating fans to a host of songs from his throughout career, plus plenty of surprises, in this electrifying show! Don't delay – tickets will sell quickly! Originally making his name in the industry as a songwriter in Nashville, American country artist Eric Church co-wrote Terri Clark's 2005 single "The World Needs a Drink" and Dean Miller's 2005 track "Whiskey Wings" from the album Platinum before embarking on his own music career. Signed to Capitol Nashville in 2005, Church's debut album, Sinners Like Me, was released in 2006 and launched three singles that all reached the Top 20 of the Billboard country charts: "How 'Bout You", "Two Pink Lines", and "Guys Like Me". Church's third studio album, Chief (2011), hit number one on both the Billboard 200 and the Billboard Top Country Albums charts, and gave him his first two number one singles on the U.S. Billboard Hot Country Songs chart: "Drink in My Hand" and "Springsteen", as well as earning him a Grammy Award nomination. Throughout his career, Church has collaborated with artists such as Luke Bryan, Jason Aldean and Keith Urban. His sixth studio album, Desperate Man, was released in October 2018.